Visitors who come to Peru as tourists or on any other short-term temporary visa can drive with their national driver’s license in Peru for up to 183 days. To be prepared for all eventualities it is however recommended to apply for an international driving license in your home country before visiting Peru, this way avoiding language barriers and discussions about the categories you are allowed to drive. Foreign residents however have to get a Peruvian driving license as soon as they receive their carné (Peruvian foreigner ID). Even though many don’t do it and never have problems with their national / international driving permit not even during a random traffic check, in case of an accident the police might accuse you of driving without a Peruvian license and blaming you partly or completely for the accident even though it wasn’t your fault. In this case insurance companies might refuse payment. So while it is of course some hassle to get a Peruvian driver’s license, in the end it might be wiser. 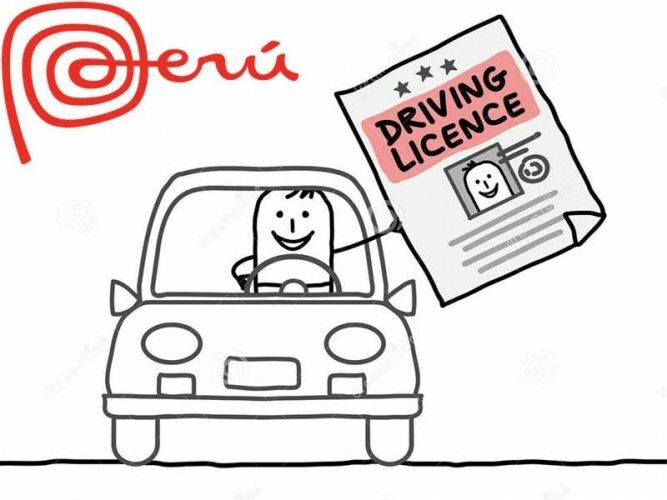 According to Peruvian law foreigners can exchange the driving permit they obtained in their home country (or any other country) for a Peruvian driver’s license. At first glance the requirements seem easy to meet and include original and copy of the applicant’s carné (Peruvian foreigner ID), original and copy of the applicant’s driver’s license issued outside Peru and passing a written exam. However, on the requirement list you can find as well that the foreign driving license has to be authenticated with an Apostille or legalization (embassies of some countries authenticate that the foreign driver's license is valid) and the categories which the applicant is allowed to drive have to be “translated” to the Peruvian system. Getting this done might be the first hurdle to overcome if you want to exchange your driver’s license. Additional even though not on the requirement list often an extract from the central traffic register of the country where the driver’s license was issued indicating accidents and traffic violations of the applicant is asked; of course, this has to be apostilled or legalized as well. Getting this document in many countries is impossible or time-consuming and expensive. So, in the end it might be easier, quicker and way cheaper to just obtain your Peruvian driver’s license from scratch in Peru. How to obtain a Peruvian Driver’s License? For driving a privately used car, station wagon, SUV and Pickup with a maximum of 5 tons you have to apply for a Peruvian driver’s license Clase “A” Category I (A-1). Nice and simple information on all other driving license categories can be found on the website of Peruvian Government or a little bit more technical on the website of the MTC, the Peruvian Ministry of Transport and Communication. Please be aware that you have to have the A-1 driver’s license before you are allowed to obtain any other. You are not required to attend a driving school or take a certain amount of driving lessons! The medical exam has to be done at one of several authorized clinics in Peru and costs around S/ 75 to S/ 100. Once you passed, you get a certificate which is valid for 6 months. The written exam tests your knowledge on Peruvian traffic regulations, infractions, penalties, efficient driving, first aid, etc., so nothing really different from back home. The exam consists of 40 questions that have to be answered within 40 minutes. To pass, you have to answer at least 35 questions correctly. On the website of the Peruvian Ministry of Transport and Communication you can take a practice test online. Below in the attachment section you can find all the exam questions according to the class. Please note: for years Peru required that applicants had to show proof of having completed secondary education / high school. While foreigners should have been exempted from this requirement, it still was asked. Anyway, since March 2018, when the regulations for obtaining a driver’s license in Peru were up-dated, a school diploma isn’t an the requirement list anymore. First pay the fee at any Scotiabank, Interbank or BIF. Then register on the website of the Peruvian Touring and Automobile Club and make an appointment. Make sure to confirm the terms and conditions under “Condiciones” and to choose “Examen de reglas de transito”. Print your appointment confirmation. You can as well call 615-9328. If the system doesn’t allow you to choose between written and driving exam, best call and confirm if you need an appointment for the written exam. This only applies to Lima, in other cities the procedure may vary. Best check with your local Evaluation Center. On the day of your appointment arrive 30 minutes early with all above mentioned documents at the evaluation center; in Lima it's at the Peruvian Touring and Automobile Club located on Av. César Vallejo 651, Lince. If you don’t show up on time, your appointment is canceled. Then answer the 40 questions in 40 minutes or less. If you don’t know the answer to one of the questions, you can skip it and return later. You have to get at least 35 questions correct. So 6 wrong answers and you fail. You can, if necessary, take the written exam two more times. First pay the fee for taking the driving exam at any Scotiabank, Interbank or BIF. When you are in Lima make an appointment for the driving exam on the website of the Peruvian Touring and Automobile Club. It is highly recommended to practice for the driving exam on the practice course that is located near the test course at km 20 of the PanAmericana Sur, Villa el Salvador, Lima before your actual driving exam. The practice course is a replica of the actual test course and allows you to get a feel for the exam, get to know what the driving examiners expect and allows you to practice diagonal and parallel parking in the super small parking spaces. To enter you have to show all your documents. More or less S/ 50 well invested. On the day of your appointment arrive 30 minutes early at the driving evaluation center in Conchan, km 21.5 of the PanAmericana Sur, Villa el Salvador, Lima with all above mentioned documents. For the driving exam you can either bring your own car or rent a vehicle on-site. We highly recommend bringing or renting a small car which makes it easier to pass the parking test. Since January 2018 the driving exam consists of two parts: the first part is done on the test course, either with your own or a rented car. If you passed this, the exam continues on public roads and there takes about 30 minutes. For this part of the driving exam a car with dual controls is used that additionally has a camera and microphone installed. When you are finished with the driving exam, wait for the results. If you passed, you are handed a certificate. If you fail the driving exam, and this is nothing uncommon, you can take it 2 more times. If you fail all 3 times, you have to wait for three months to start with the complete process again. Once you passed the medical exam, the written exam and the driving exam you can apply for your Peruvian driver’s license. First pay S/ 24.50 at any Banco de la Nacion branch or if you are in Lima on pagalo.pe for the MTC administrative procedure 01600 Licencia de conducir – Expedición de Licencia de Conducir. See our article “Paying administration charges and processing fees in Peru” for detailed information on paying fees in Peru. With all your documents (certificate of medical exam, certificate of passed written and driving exam, forms, receipt) you then can apply for your driver’s license at the office of the MTC responsible for issuing the permit or corresponding offices in the provinces. Find here a list. When you apply online, print the application form and bring it together with all your other documents when you pick up your driver’s license. Congratulations! You made it! For the next 10 years you now can legally drive in Peru. All information is published to our best knowledge and should give you a general guidline on how to obtain a Peruvian driver's license. As regulations, requirements and practices can change without prior notice, all information is subject to change! Therefore we recommend checking the current regulations and requirements with the Peruvian Ministry of Transport and Communication and the Peruvian Touring and Automobile Club shortly before starting the process.